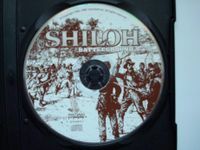 Battleground 4: Shiloh is a turn-based strategy computer game developed by TalonSoft in 1996, the fourth issue in the Battleground series. It simulated combat at the 1862 Battle of Shiloh, using both a video version of miniature wargaming and board gaming. Terrain hex maps are 3D or 2D with various scales and sizes. The basic platform for the Battleground series involves individual infantry and cavalry regiments, artillery batteries, and commanders. All are rated for strength, firepower, weaponry, morale, and movement. As a unit takes fire, it may become fatigued, disordered, or routed to the rear. Players compete against the computer's artificial intelligence or against another player via modem. Players may try a variety of 25 individual scenarios, or refight the entire Battle of Shiloh. A Fog of War option enhances playing against the computer, as it hides units that are not in direct view of the enemy. Source: Wikipedia, "Battleground 4: Shiloh", available under the CC-BY-SA License.